The schools, administrators, and teachers who give us valuable class time and their support. Shout outs specifically to Newport High School,Western Hills, Ludlow, Mason County, Bracken County, Augusta Independent, and Simon Kenton! Gateway Community and Technical College who has opened their doors for us the past 5 years. Various community members who have attended Green Dot events or have supported Green Dot. Impact 100 for placing faith in us to expand even more into our community. Support from the different departments and staff at Women’s Crisis Center. Limestone Ministerial Association who is working towards becoming a Green Dot community every day. Haile foundation for allowing us to expand into Western Hills University High School. KASAP who continues to provide guidance in implementation. 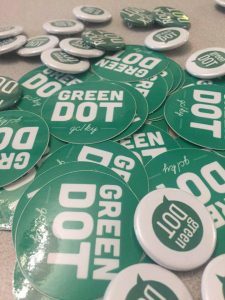 Green Dot etc, for providing us with an exciting program that measurably reduces power-based personal violence in our communities that is also pretty fun! Every single person who has put a green dot (or multiple green dots!) on our map. 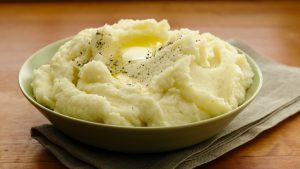 We’re also thankful for mashed potatoes, because they’re pretty awesome! Thanksgiving is not only a great time to eat a lot of great food and spend time with friends and family, but to also do some proactive green dots! Conversations around Green dot and violence prevention helps make our communities safer and create norms that violence is not okay and everyone is expected to help! What are you thankful for this year? What Thanksgiving food are you looking forward to eating?